As part of Lendlease?s urban renewal project for Barangaroo South, AR-MA and ARC Roofing collaborated with Rogers, Stirk, Harbour, and Partners, Lendlease Design, and ARUP on the technical design of the modular, pre-fabricated atrium roof for International Tower One. 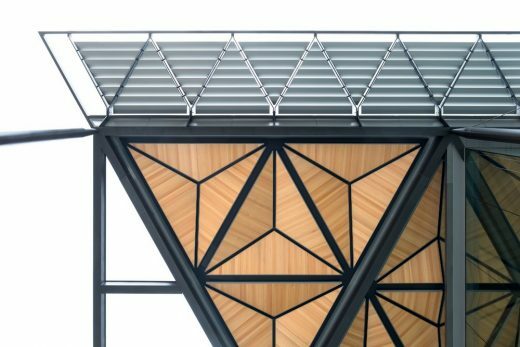 Working on top of ARUP?s structural steel frame, AR-MA worked with ARC Roofing to design, fabricate, assemble, and install, the roof modules, finished with flat-lock zinc panel, within exceptionally tight tolerances. To ensure the required accuracy, AR-MA developed and maintained a full, virtual-design-and-construction, parametric model throughout the project. Following confirmation of the design, this model was then employed within a file-to-factory pipeline to produce all required zinc and sub-structural steel components. These were then assembled in ARC Roofing?s factory and sent to site for installation.